That little deer photo is adorable! I love deer too (I even named my blog after one)! Oh, and I'm your newest follower, so "HI!" I told you I've been listening to this all morning... Well, Caress Me Down just came on and I cracked up! I love that song but definitely didn't expect it! Hello high school flashback! We need to be friends. I'm loving this! 5 Years Time is one of my all time FAVE songs! Ok. This clinches it. We're made to be bloggy friends. Cute blog girl! Glad I found you. Your blog is ADORABLE! Keep the inspiration rolling! Love the pics and the editing tricks!!! Nice to meet! Your blog is fabulous. I am also so addicted to thrifting, although my drug of choice is decor stuff and Pyrex. Sweet Jesus do I love Pyrex. Just wanted to tell you your blog is gorgeous and your DIY's are so inspiring. I'm so happy that I've found your blog, it's adorable! I love your DIY projects! 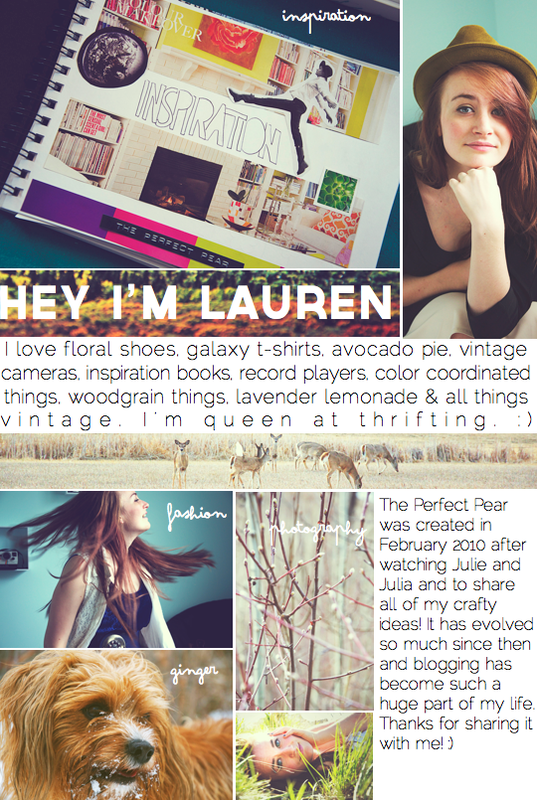 Your blog layout is so so super cute!! Thanks for taking the time to leave a comment! :) You are so sweet! Blog design by The Perfect Pear Designs!! . Powered by Blogger.